Researcher at Dimmons (Digital Commons Research Group at the Internet Interdisciplinary Institute – Universitat Oberta de Catalunya). He holds a PhD in the Information and Knowledge Society from the UOC. 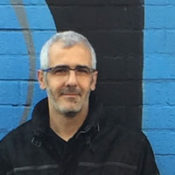 He has concentrated his research on the economic and social impact of digital platforms, focusing his thesis on the study of organic farming consumer cooperatives: He holds a degree in the Fine Arts from the Universitat de Barcelona and has extensive experience in the field of education and the visual arts.